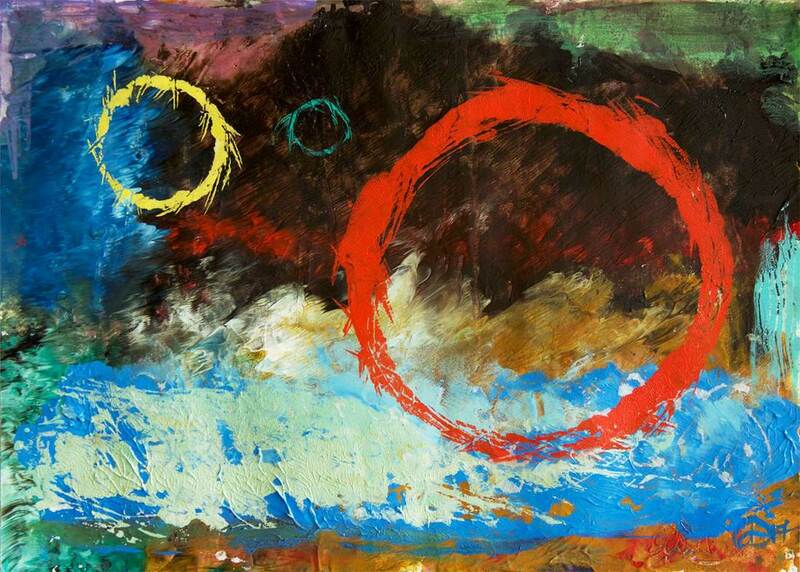 Second in part of a series of three original acrylic monoprints on paper inspired by the sun and solar eclipse titled "Don't Be Afraid of the Sun" measures 12" (30.48 cm) x 9" (22.86 cm) with a dynamic aesthetic appeal that is also harmoniously balanced in colours of black, dark and light blues, cream yellow, brilliant red and gold and dark ochres. The image goes right to the edge of the paper and it is signed in the lower right hand area. Done in professional artist Golden and Winsor & Newton acrylic paints.